The Department of Public Works (DPW) supports economic and business development in Baltimore City and throughout the region. Serving one of the most diverse regions in the country, DPW invites local minorities, women, and/or disadvantaged businesses to learn more about its Small Business Development Training Program. 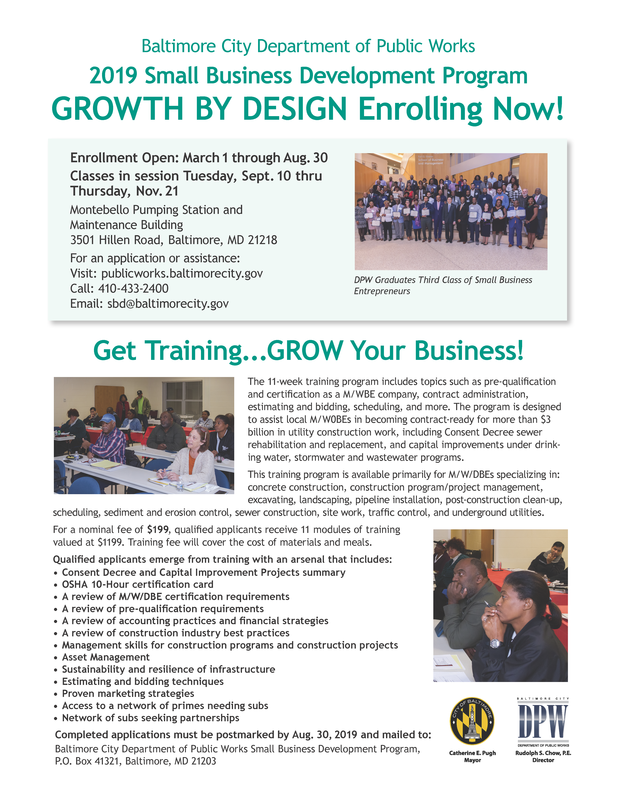 DPW’s Small Business Development Program offers construction management classes. This 11-week course is designed to make sure participants are contract-ready for the more than $3 billion in utility construction work, including Consent Decree sewer rehabilitation and replacement, and capital improvements under drinking water stormwater and wastewater. APPLICATION DEADLINE: Aug. 30, 2019. Mail completed applications to: DPW Small Business Development Program, P.O. Box 41321, Baltimore, Md. 21203. Please click here to download the 2019 application for the Small Business Development Program. In addition, applicants can register online. Click here to register online. An overview of the program is available in the following documents: "2019 Small Business Development Flyer." There is a nominal registration fee of $199, and participants will receive training modules valued at $1,119. All M/W/DBEs must complete an application prior to program participation. For more information about the training program, please call 410-433-2400 or send an email [email protected]. Construction Best Practices — specialized training for trenchless sewer repair, site restoration, manhole repair, and lateral connections. Individuals interested in advancing their companies and enhancing their knowledge of sewer rehabilitation work and related support services are invited to participate in the training Program. This program is designed to improve knowledge of utility construction and sewer rehabilitation work and prepare local certified and certifiable M/W/DBEs to be contract-ready. For this training program, DPW is targeting companies that specialize in concrete construction, construction program/project management, excavating, landscaping, pipeline installation, post construction clean-up, scheduling, sediment and erosion control, sewer construction, site work, traffic control, or underground utilities. 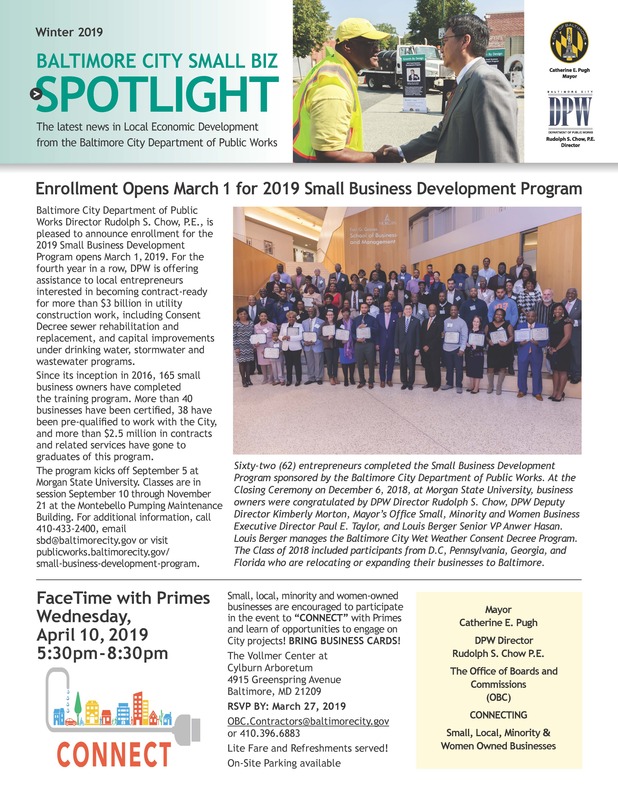 Review the Baltimore City Small Biz Spotlight newsletter for updates on the Small Business Development Program and the latest news in local economic development from Baltimore City DPW.